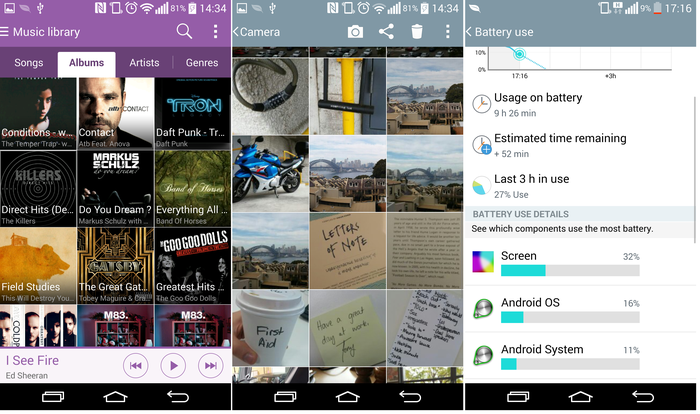 Almost everything about the LG flagship represents an improvement. The design and screen put LG in a league of its own, while LG’s laser autofocus technology brings genuine innovation to the stagnant smartphone camera. Unfortunately, the G3 is too powerful for its own good. The 3000 milliamp-hour battery isn’t large enough to offset the 1440p display’s hunger. Those with piqued intrigue should consider living with a phone that has half to almost one day battery life. If the sacrifice isn’t too much, then buy the G3. LG is readying the local release of its best smartphone to date, the G3, right when hysteria for the Galaxy S5 has tired. Innovations include a 1440p screen, a laser autofocus camera and worthwhile software add-ons, but is the G3 good enough to push LG out from under Samsung's shadow? Every part of the G3 looks to be pushing the absolute limits of what is technically possible for a smartphone. Simple styling brings this to the forefront. Double tap the Gorilla Glass and a 5.5in screen powers. It’s the lack of bezel that captures our attention; no other smartphone has managed to cut the fat so savagely. Flipping the smartphone reveals the LG’s fat-cutting method of shifting buttons to the rear. A removable back cover is studded by power and volume buttons. Placement is below a high resolution camera and adjacent to a dual-LED flash. A hairline finish on the faux metal cover accentuates the smartphone’s ergonomic curve, which proves key in keeping the G3 phablet as comfortable in the hand as its 5in competition. Up until now the HTC One (M8) was our darling looker of 2014. The G3 might not have the One (M8) beat on materials, but the combination of a bigger screen, thinner bezel and brushed body is enough to sway our opinion: the G3 is the best looking smartphone to launch locally in 2014. 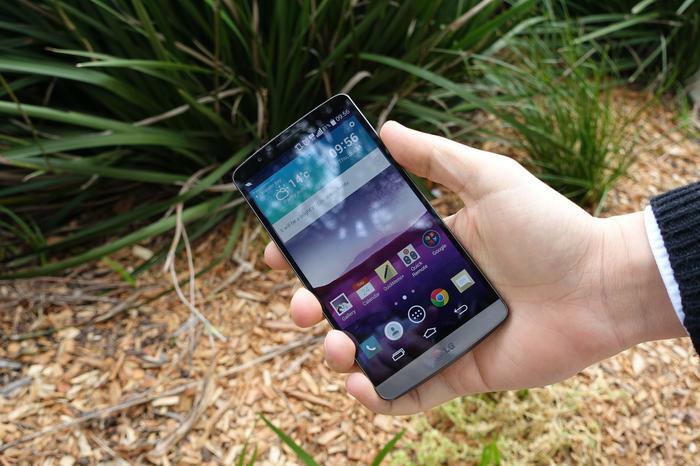 Note: The LG G3 goes on sale in Australia on 4 August. 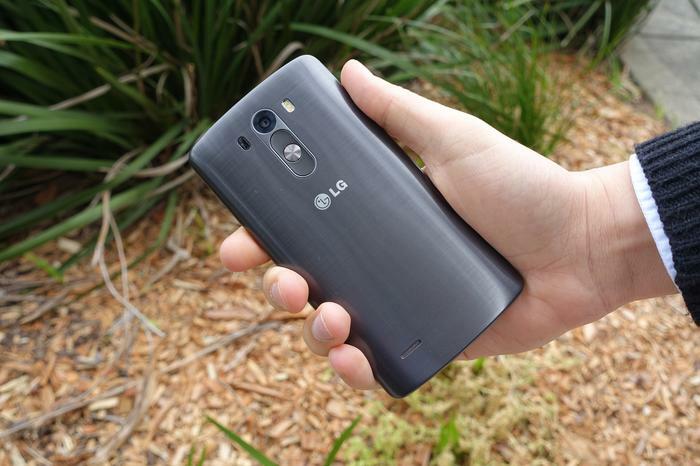 The unit reviewed by Good Gear Guide was provided by online retailer UniqueMobiles, who is currently selling the LG G3. This review will be updated when GGG receives a local G3 for review. Update, 15 Aug This article's battery life section has been updated accordingly. No other smartphone has launched in Australia with a 2560x1440 resolution display. The G3’s 5.5in display packs 534 pixels-per-inch, which far exceeds the 432 pixels-per-inch (ppi) delivered by Samsung’s Galaxy S5, the 441ppi of HTC’s One (M8) and the 326ppi of Apple’s iPhone 5S. Technically the rich screen of the G3 has four times the pixels of a high-definition television. All multimedia, whether it’s zooming in on a high resolution photo or watching a compatible 1440p movie, is richer when it’s watched on the G3. A 5.5in screen classifies the G3 as a phablet, but the smartphone’s fine bezels ensure it is no taller than the 5in HTC One (M8). LG integrating a display of this calibre in its G3 represents the company leapfrogging Samsung in the display department. For all of the G3’s innovation and hardware, the flagship could’ve been spoiled if the software hadn’t matured. 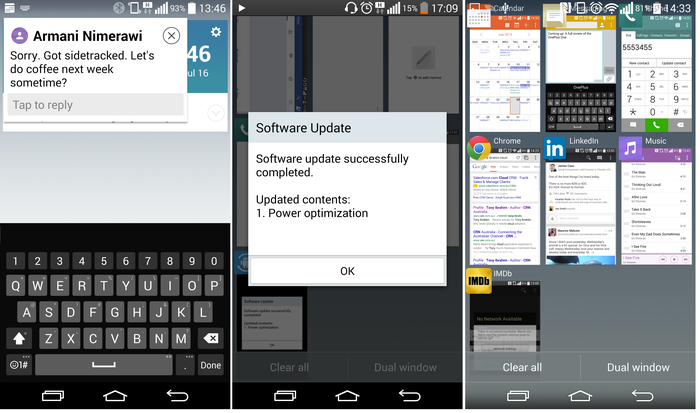 LG has fitted the current Android 4.4 KitKat operating system with an overlay closer to Android’s design language. Circular shapes are prominently featured, applications are colour coded and there’s a fashionable flatness to the iconography. Connectivity is top notch with the G3 packing 4G, dual-band Wi-Fi 802.11ac, Wi-Fi Direct, Bluetooth 4.0, NFC, Miracast and a microUSB SlimPort. Several additions have been made to LG’s rendition of Android. Standouts include knock-code and, although it may seem redundant, an intelligible keyboard. Typically entering a password and unlocking your smartphone requires two separate steps. Knock code combines two steps into one by recognising a patterned and unlocking the smartphone simultaneously. The patterned tap can be done across the whole screen or over a fraction of it; no matter, the smartphone will be unlocked provided the pattern is the same. 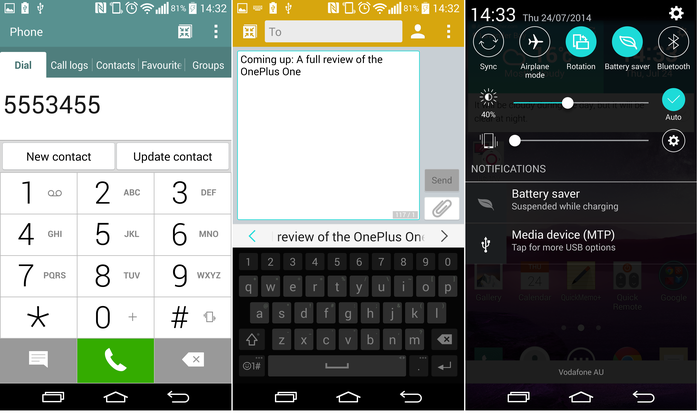 LG’s keyboard earns a mention for its intuition. Swiping left or right over the spacebar grants you control over the cursor for simple editing, while the settings menu makes it possible to resize the height of the keyboard. There’s a tact to the way the G3 handles incoming text messages. Rather than necessitating the messaging app to be opened mid-way through whatever you’re doing, incoming messages pop-up on a fraction of the screen with the added option of inputting text. This is yet another way LG caters to its customers’ needs while asking of them less. Our only gripe with the G3’s software is the colour scheme. 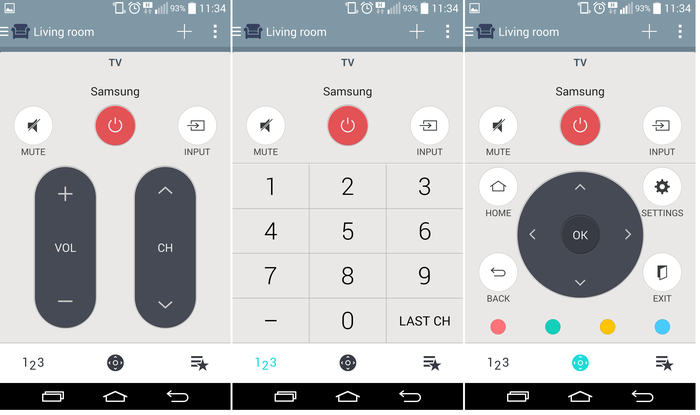 Some colours fail to take advantage of the vibrant screen and leave the interface looking less attractive than the colouring adopted by HTC’s Sense UI. As far as gripes are concerned, this one is an easy trade off for the many improvements.